Story Synopsis: General Kevin Matthews must stop an evil saboteur from destroying Earth's first city beneath the sea. 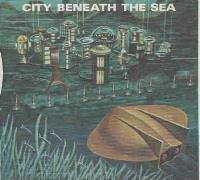 The ABC presentation film opens with an excellent shot of the underwater city then a quick cut to stock Voyage to the Bottom of the Sea footage of the Flying Sub (here re-named the Mini-Sub) about to dive. The interior footage is the Land of the Giants Sprindrift cockpit set not the flying sub for some reason. The chairs have been replaced by FS-1 chairs. 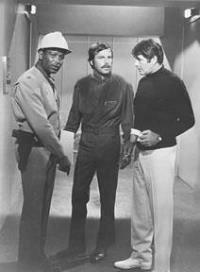 The date is revealed to be June 12 2068-Irwin Allen's birthday. A better view of the city reveals it to be a matte painting with lots of tiny lights added. In fact to save time and money most of the sets are paintings, some painted in garish colors, with small "live" sections matted in. Matthews rides a Lost in Space freezing tube here transformed into an elevator to the control center, the heart of the city. Everybody wears turtleneck shirts a la Star Trek. In fact, Harmon Temple III (played with scene-chewing evilness by actor Lloyd Bochner) has a red turtleneck complete with a Trekkish insignia over his heart. 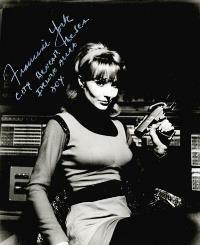 Pretty Francine York, Noble Niolani in the Lost in Space episode "The Colonists" and later to co-star in Allen's "The Time Traveleres" is a welcome addition to the cast, although the rest of the cast are silly stereotypes-an Irish engineer cleverly nicknamed "Irish", an oriental security chief named Choo Choo and the worst offender a half-human half-amphibian hybrid who can breathe underwater named Dr. Raymond Aguila who looks like Mr. Spock, acts like Spock and even uses the word "logical" in a sentence! 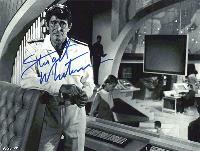 In an interesting aside Lawrence Montaigne who played Aguila was briefly considered as a replacement for Mr. Spock when Nimoy threatened to quit Star Trek in a contract dispute and eventually wound up playing the Vulcan suitor Stonn in the "Amok Time" Star Trek episode. James Brolin, who plays Wild Bill Tyler the resident hot-headed antagonist uses the word "damn", probably the first time someone swears in an Irwin Allen production-at least on camera. Glen Corbett, a veteran of such TV shows as Land of the Giants and Star Trek does a good job in his role as do Brolin and the rest. There is very little underwater filming and none with the miniatures due to the miniscule budget. Perhaps the best scene comes at the climax of the show as Matthews and Temple the saboteur fight to the death atop an exploding oil derrick, struggling amidst superimposed and real flames, ending in the violent death of Temple. Despite Irwin's attempt to make this a soggy Star Trek saga it's not bad at all-lots of color, action and explosions make this an enjoyable pilot episode. No credits are given to the writer or director but being a "first episode" one can assume Irwin Allen had a hand in both.